Consolidated B-24 Liberator heavy bomber. 71kb and see readme for simple instructions. A very highly detailed bomber, bristling with turrets and capable of carrying large sums of bombs. Developed from the original CFS2 AI version. 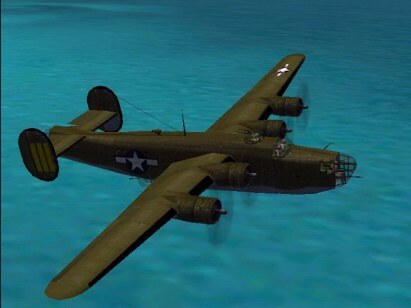 Contrary to popular belief, the B-24 was probably far superior than the older, and famed, B-17 Flying Fortress. The B-24 was faster, had a heavier bomb load, equal (if not superior) armament, and was equally rugged. The B-24 does receive some of the credit but it is still to this day overshadowed by the Boeing B-17.